Laughing gas, or nitrous oxide, is a pain relief method that is reemerging in the United States as a way for birthing people to help control pain in labor, with fewer side effects than traditional pain relief methods like the epidural or intravenous (IV) medications like Demerol or Stadol. You may have heard about laughing gas as something used to help relax you while at the dentist; this is the same medication. Laughing gas is also tasteless and odorless. This makes it easier to use and more palatable to the laboring person, as some people worry about being able to taste the medication, much like you can with many breathing treatments. While laughing gas fell out of favor in the United States, other countries never stopped using laughing gas for laboring patients. In fact, you can find many references to it in popular culture shows like “Call the Midwives.” In other countries, it is frequently called gas and air. You will find that it is very commonly used, even in home births. In one study, given the choice between an epidural and laughing gas, about 20 percent of the laboring patients chose laughing gas and 60 percent of these women went on to give birth with no other anesthesia. Both groups, the epidural group, and the laughing gas group, were asked to rate the effectiveness of their chosen pain relief. While there was more variability in the laughing gas group in terms of how effective laughing gas was at taking away the pain, there was a higher rate of satisfaction overall when compared to the epidural group. How Is Laughing Gas Given in Labor? One of the real benefits to laughing gas is the ease and speed at which it can be given. Most of the rooms are equipped with the ability to use laughing gas, or a small wheeled tank is moved into the room. It is simply a combination of nitrous and oxygen that is self-delivered through a face mask. When you have a contraction, you lift the mask to your face and breath normally. You lower your hand and you are no longer getting the treatment. It is recommended that you start to breathe in the nitrous oxide about thirty seconds before your contraction begins. This helps the concentration of medication to achieve peak levels at about the same time as the peak of your contractions. It may take a few contractions to figure out the perfect timing for your pain levels and tolerance. You can use a fetal monitor as a guide to help you figure out when your contraction will begin or rely on those around you like your doula or labor nurse to help guide you. One of the benefits of laughing gas is that it is relatively easy to use and requires no special safety equipment short of the delivery system itself. It can be started very quickly and easily and begins to provide pain relief within a minute of use. This is much faster than most medications and other medical forms of pain relief. It also does not preclude the use of other forms of pain relief, including an epidural. This might make it a great way to bridge the time between a request for an epidural and when the anesthesiologist is actually available. One mother explains it like this, "I was able to have complete control of the situation. I liked that I could simply raise the mask and use it when I needed it. I thought that would be every contraction, but it wasn't. I'd sometimes go several contractions before needing it again. This was pretty empowering." The equipment used to provide the laughing gas is set to deliver fifty percent oxygen and fifty percent nitrous oxide. It cannot be altered or adjusted. This is what sets the delivery system apart from those used in dentistry. It is also important to note, for safety reasons, that this gas is non-flammable. During Which Stage of Labor Is Laughing Gas Used? Laughing gas is available for all stages of labor, unlike other pain medications. This can make it a great choice for a last minute need for pain medication, particularly when you need it to work quickly. So you could use it early in labor while you are trying to decide or waiting for an epidural. You could use it in transition, when you may not have time for an epidural or IV medications might be too risky to use. You can also use it while you are pushing or during the birth of the placenta. This use can include the repair phase of a delivery and the delivery of the placenta, or a manual exploration of the uterus. These are two phases during which you may see increased pain because of medical procedures, especially if you haven't had an epidural. You could use laughing gas as a way to help when epidural anesthesia isn’t enough. Some practitioners even use laughing gas during the administration of the epidural to help reduce fear and tension during its administration. What Are the Side Effects of Laughing Gas for Labor? There are no known side effects for labor. In fact, when looked at, this method of pain relief didn’t alter any of the outcomes in terms of cesarean sections or assisted deliveries like forceps or vacuum extractions. It also does not seem to have an effect on the length of labor. Another way to look at this is how labor is affected in terms of your movement, monitoring, etc. While you do need to be near the delivery equipment, it is also portable. Because laughing gas does not make you numb you have complete freedom of movement. You are able to assume positions that are comfortable for you and still use the laughing gas. Feeling like kneeling backwards over the bed? Go for it! Many women really like the fact that this does not make their bodies numb so that they can respond to their labor with movement. Many hospitals will not place any restrictions on a laboring woman who uses laughing gas. Though, you should be cautious as you begin to use it when assuming positions that may be less stable. An example might be using a birth ball and nitrous oxide. You would want to use a base to help stabilize the ball or have your partner or doula helping you to ensure that you're stable. You may also be able to use this while in the tub. This is certainly a question to ask when you're on your hospital tour. Is There Any Reason to Not Use Laughing Gas? The two contraindications of using laughing gas are those who have had recent inner ear surgery (because of the delivery system), and those who have a vitamin B12 deficiency. Though the risks of problems for those with a vitamin B12 deficiency are reported when using nitrous oxide as anesthesia, and not analgesia, such as we use it in labor and birth. What Are the Side Effects of Laughing Gas for Your Baby? There are no known side effects in the newborn and there isn’t a known increase in fetal distress that is seen with other medications. It also does not alter the alertness of the newborn, and therefore, doesn’t alter how the first breastfeeding sessions go with you and your baby. What Are the Side Effects of Laughing Gas for You? Most of the people who use laughing gas for labor report that they are very pleased with the outcomes. That said, no medication is completely free of side effects, though, this doesn’t mean that everyone will experience these side effects. Some of the people who have used laughing gas have reported nausea, vomiting, dizziness, and drowsiness. Though the vast majority just talk about experiencing a sense of relaxation during the contractions and use of laughing gas. Either way, these side effects, should you experience them, are short lived, and quickly dissipate when you discontinue the use of the laughing gas. My Hospital Doesn't Offer Laughing Gas, What Can I Do? If your hospital has not yet started offering nitrous oxide, be sure to ask if it's in the works. Since it is something that is relatively new within modern hospitals, they may be in the process of developing guidelines for its use in your area. If they are, simply ask when they anticipate that it will be ready. If they have not yet started to explore the option, you might try to send a letter to the nurse manager at the labor and delivery unit to ask them for help in who you could talk to in order to make it a reality. "I couldn't get an epidural because of a certain medical condition, and didn't want to be drugged up like I feel with typical IV medication, so I thought this sounded like a perfect happy medium. Unfortunately, it wasn't available. My doctor and midwife were really great about helping me figure out how to get it to work at our hospital," says one mother. "It was supposed to be just for me, but the nurses thought it was so amazing, they now offer it to all patients." Certainly, your provider is someone to talk to about your desire to try laughing gas for labor. They may be able to offer it in a one off situation. They may also be able to help you in getting the policies put in place at your hospital. Having them help you champion this process is a really big help. Truthfully, patient-led requests are often what changes hospital policies in many cases. A few letters and many times you will have an answer. Basically, you'll never know if you don't ask! Be sure to ask if your hospital, birth center, or home birth provider use laughing gas. You may want to know if there are reasons that you should not use nitrous oxide or if there are things that would mean it’s not right for you. Collins MR, Starr SA, Bishop JT, Baysinger CL. Nitrous Oxide for Labor Analgesia: Expanding Analgesic Options for Women in the United States. Rev Obstet Gynecol. 2012; 5(3-4): e126–e131. Likis FE, Andrews JC, Collins MR, Lewis RM, Seroogy JJ, Starr SA, Walden RR, McPheeters ML. Nitrous oxide for the management of labor pain: a systematic review. Anesth Analg. 2014 Jan;118(1):153-67. doi: 10.1213/ANE.0b013e3182a7f73c. Richardson MG, Lopez BM, Baysinger CL. 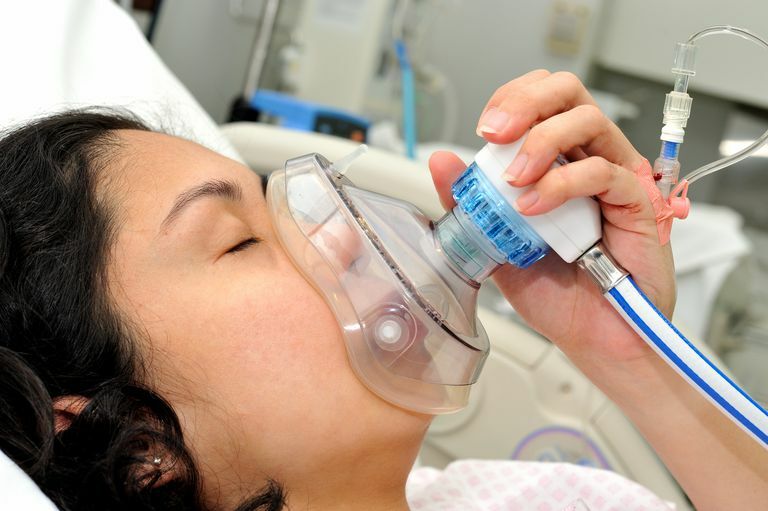 Should Nitrous Oxide Be Used for Laboring Patients? Anesthesiol Clin. 2017 Mar;35(1):125-143. doi: 10.1016/j.anclin.2016.09.011. Richardson MG, Lopez BM, Baysinger CL, Shotwell MS, Chestnut DH. Nitrous Oxide During Labor: Maternal Satisfaction Does Not Depend Exclusively on Analgesic Effectiveness. Anesth Analg. 2017 Feb;124(2):548-553. doi: 10.1213/ANE.0000000000001680.